Lately, I’ve been trying to read The Rings of Saturn by W.G. Sebald, on the RABID recommendation of a few friends. So far, it’s kind of falling into the Gram Parsons Zone for me– I appreciate it, but it’s not really taking. One detail that I loved, though, is the mention of attempts in 1870 by two British scientists named (this is the best part:) Herrington and Lightbrown to use the glowing oil excreted by dead herrings to light the world. Their idea was that, since herrings mysteriously light up as they die, maybe a self-regenerating source of luminescence could be produced from tiny thirst-inducing fish. 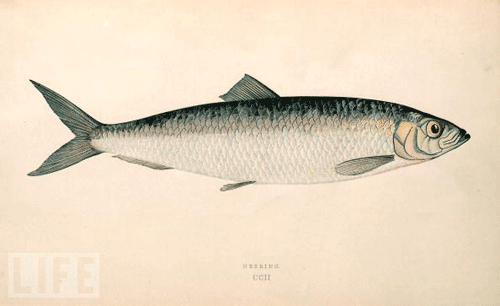 I love the idea of herrings becoming a key commodity in the modern world. This would be convenient because, as Sebald mentions, every herring lays enough eggs to produce a volume of herrings 70 times the size of the earth. Also, imagine having a business card that states your name as ‘Herrington’ and underneath in smaller letters says ‘Herring Expert’. Outstanding. If you wake up in the middle of the night after a couple hours of sleep (something that’s been happening to me a lot lately– see above micro-anxieties), it turns out this is what people routinely did for thousands of years, up until the industrial revolution. People would sleep a few hours, then get up, smoke a pipe, hangout, whatever, for a bit before going back to bed for a ‘second sleep’. Makes sense when there was no way for most people to afford artificial light, and so nighttime was about a billion hours long in winter. I guess this is when all the brooding got done in plays like Hamlet– he was up pacing around between sleeps. The whole two-sleeps thing had been buried for good by the time that Edison invented the electric lightbulb and (as an art history documentary I show my designs students puts it) ‘the faery of electricity was loosed on the world’. It’s sort of weird to imagine society suddenly ‘launching’ the lightbulb as a product and– for that matter– electricity in general. 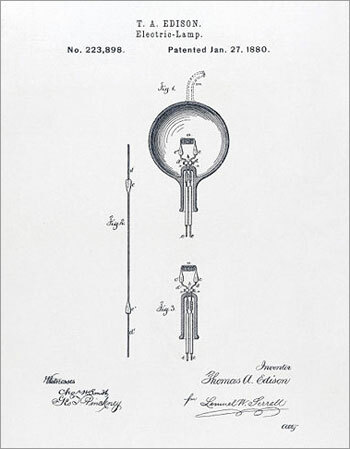 I mean, I assume that lightbulbs were first introduced at a municipal level in the form of street lamps– you didn’t just go out and buy a lightbulb in the early days. But how, then, did the whole thing eventually spread to rural American homes? You need an electricity-powered lamp if you’re going to buy a lightbulb… but you also need a proliferation of lamps before the local store is going to start carrying lightbulbs. So how did it start? The same conundrum sort of applies to electricity in general: how did they convince a ignoramousy public to allow electricity to be installed into their homes if there was nothing to use this mysterious force for? I do vaguely remember learning that in the early days, a pointless little rubber mat was sold to a fearful Americans that you were supposed to place on your floor underneath the electrical socket, to ‘soak up’ any stray electricity that might happen to leak out of the wall socket and dribble down the wall. Such was their understanding of the whole phenomenon. Unfortunately, the internet is letting me down in terms of turning up a photo to confirm this, so you’ll have to take my word for it. 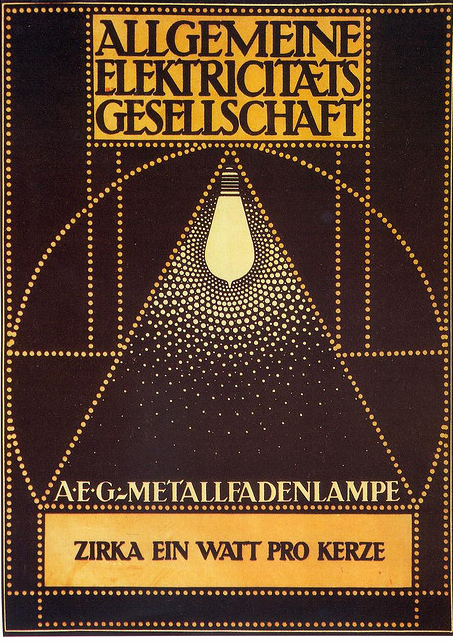 (Top image: Peter Behrens’ fantastic AEG ad from 1907, promoting a new lightbulb. Pretty early instance of the basic visual vocabulary of abstraction finding its way into mass commercial media).